New Wind Turbines from Day4Europe! Day4Europe, in collaboration with a research and development Company that has long been working in the development of Wind Turbines, presents a new family of products suitable for household and small business companies. These Wind Turbines are characterized by some fundamental concepts that have allowed the achievement of excellent results such as an easy installation: they have some key features: first they have a vertical axis. Wind Turbines with vertical axis are characterized by the fact that energy conversion happens also with winds which have variable direction, so these products can be installed in locations in which traditional Wind Turbines with a horizontal axis presents little yield. 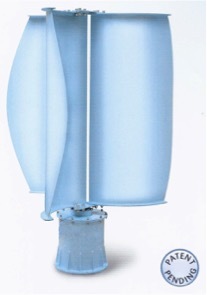 The Vertical Axis Wind Turbines are very quiet and definitely more attractive from the point of view of aesthetics. The innovations introduced by these products are many and patented: as mentioned above all the ability to operate with winds not too directional and constant: these turbines can be installed in places where in the surrounding area there are obstacles such as buildings or trees. These Wind Turbines have another patented innovation and developed specifically for these systems: the electric generator which has a very high conversion yield mechanical to electrical and they are linear in power for almost any wind. These Wind Turbines have already been installed with success and satisfaction in Europe and South America and field tests have confirmed the expected excellent performance of these machines. Wind Turbines can be customized in color and other aesthetic features.